Welcome to the first Shabbat Special, the one corner of Bad Hebrew Tattoos that is not about Hebrew tattoos gone wrong! In this new weekly corner, published every Saturday, I'll showcase Hebrew tattoos which are lovely and special, and also some bad Hebrew that isn't necessarily tattoo related. Today's feature is a nicely rendered tattoo of the name Yosef (the Hebrew form of Joseph). See how the name is seamlessly embedded into the design? That's a good Hebrew tattoo! Yosef tattoo is a work of Theresa Gordon Wade. Also, behold this truly beautiful Hamsa. 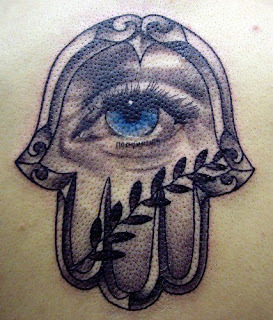 Hamsa, in the Jewish tradition (and several others, too) is a symbol of good luck and protection from the evil eye. I'd have to say the charm worked, as the tattoo looks really good. You should know - the good Hebrew tattoos are extremely rare. I don't mean correct Hebrew tattoos, there is plenty of that going around. I mean the genuinely good looking, thought out, beautiful tattoos. Those are a rarity. Do you know of any Hebrew tattoo that fits the bill? Mail it to typotat@gmail.com, for a chance to be featured on BHT's Shabbat Special! Also - Hamsa has no standing in Judaism, it's merely a middle-eastern folklore. Sure, Yosef was there first. As for the Hamsa, it did not originate in the Jewish religion, but it's very much a part of the Jewish/Israeli traditions now. ESP? I was 2 minutes away from suggesting it myself when I saw this delightful temporary change of pace. And we can afford to be generous with Yoseph: After all, Israeli Hebrew calls a jackhammer: 'Congo', polyethelene: 'nylon', a refrigerator: 'Frigidaire' and any power saw: 'Jackson'. Ugh. Joey can relax, it's ok. Shavua tov. I prefer small tattoos (like a treble clef or the sign on infinity on the back of the neck.. or a mysterious Hindi symbol on the breast near the shoulder). Those two seem to be big and intimidating - especially the first which seems to be just big and tasteless. Tattoo should be like a small jewel, and that tattoo turns the hand into a human canvas. That would look very bad as time goes on..
Where tattoos are concerned, everyone has their own preference. However, those tiny scribbles that you talk about - they might be tasteful and special to their owner, and all that, just not very interesting to display. I much prefer to look at something artful and unusual.